• Imagine a world where you wake up to discover you've been labeled by the CIA and FBI as the number-one domestic terrorist threat. Scarier than any horror novel, this is not a work of fiction for modern environmental and animal rights activists. 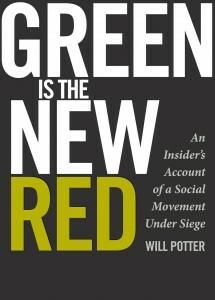 Reading Green is the New Red might be the most crucial thing any person who values freedom can do right now. I attended author and journalist, Will Potter's Bluestockings Bookstore reading last week and was riveted by the mounting anti-activist climate and rhetoric spreading enthusiastically through the political sphere and mainstream media journalism and entertainment. The result again and again is silencing and harshly punishing those who speak out effectively - and actively "chilling" dissent among those who seek change. • The 2011 Gallup Poll results are in, measuring percieved moral acceptability of controversial issues. Previously, in 2010, the most divisive issues pertained to a gender divide on three issues that involve the ethical treatment of animals. Majorities of men, but less than half of women, considered the use of animal fur for clothing, and medical testing on animals to be morally acceptable, strengthening my belief that mainstream male identity is a major roadblock to sustainability and a compassionate society. Gender aside, the majority of Americans in the 2011 polls (62%) are opposed to cloning animals, but the percentage of American opposed to fur and vivisection, while significant (at 39% and 38% respectively) are not the majority. Fur being percieved as morally unacceptable is at the highest percentage in a decade, tied with results from 2008. Despite the enormous educational and scientific efforts to showcase the cause of Global Warming, the global results of what people perceive as the cause of global warming is rather depressing for Americans (only 34%), and a shocking 36% of the world is unaware of Global Warming at all.